Despite the fact that providers of public health and care services are under a statutory duty to tackle gender inequalities, it is still often overlooked that gender inequalities affect men as well as women. This introduction to the special feature first explores some possible reasons for this male ‘gender-blindness’ and sets out some basic facts about health inequalities relating to men. After highlighting the need to research and develop male-friendly services that are tailored in particular to male patterns of emotional communication and help-seeking behaviour, the special feature editors introduce the collection of articles that follow. - There are pressures on men to appear ‘strong’ and invulnerable (Gilmore, 1990; Levant, 2007; Mahalik et al., 2003). This means that there may be an equal covert pressure in our society not to write about or study the male gender too closely. In the corner of a railway station waiting room a young woman is sitting alone. Tears are rolling down her face. At first there is embarrassment among those who notice the young woman’s distress, but after a minute or two a fellow passenger goes over to ask if she can help. Soon the young woman is telling this sympathetic stranger her sad story. On the platform outside the waiting room, a young man is half drunk. He sits on a bench staring at the place between his feet where some empty beer cans lie. Occasionally he shakes his head. Travellers waiting for the train prefer to stand rather than to sit alongside him. Eventually the man is approached by railway staff who politely ask him to leave the station. The man nods to indicate his willingness, gets slowly to his feet and goes on his way. Does this story have a ring of truth? Does it tell us something about actual gender difference, hidden perceptions about gender, or both? The truth is that we don’t entirely know, but as psychologists we should be leading the way in finding out. Sadly, until now, most enlightenment about the male gender has come not from the world of science but from the arts: from novelists, film makers, playwrights and even comedians. One thing we do know, however, is that many men avoid seeking help in all its forms and men are more likely to ‘act out’ rather than reflect on their distress (Cochrane & Rabinowitz, 2000; Connell, 2005). But why should this be the case, and what can be done about it? Why study the male gender? - Men represent 95 per cent of the prison population (Wilkins, 2010), and a significant majority of prisoners have very serious mental health problems (ONS, 1998). These facts alone show us that whilst many men may want to appear invulnerable, something very different is going on behind the scenes. The collection of articles in this issue reflects the fact that there is at least now some emerging public recognition of the need to examine these underlying themes. The success of the inaugural three-day ‘Being a Man’ Festival at the South Bank Centre in London in February also exemplifies people’s new willingness to discuss what was previously almost a taboo subject. How to find ways of reaching men in distress was high on the agenda, and several active campaigners on male health issues were among the speakers (including one of us, David Wilkins). In the articles that follow some of the issues associated with male psychology and male help-seeking behaviours are explored. All illuminate, in different ways, how health services might evolve on the assumption that there is a need to offer men with health problems the same gender-sensitive commitment that we presently offer women (Good & Brooks, 2005; Wilkins, 2010). Next up in this special feature, Dr Jennie Williams, Dr David Stephenson and Dr Frank Keating show the complexity of socialised power relationships and explore the impact of social and racial inequalities on male mental health. They identify a number of ways in which the lived experience of being male both increases the risk of some mental health problems and militates against the likelihood of getting appropriate and timely help. It also uses a variety of examples to remind us of the important point that all men are not the same. In their article, Dr Peter Branney, Dr Karl Witty and Dr Ian Eardley explore the psychological trauma of cancer in men. The cancer they choose to look at is not just any cancer – it is penile cancer, a rare form of the disease that strikes very directly at the most basic biological manifestation of masculinity. The authors also look at breast cancer in men. This disease threatens masculinity in a different way. Has the patient developed a ‘woman’s disease’? This article is an opportunity to think about the relationship between physical and mental health, and the psychological challenge that cancer may make to the sense of self. Next, Dr Linda Morison, Dr Christina Trigeorgis and Dr Mary John examine the very interesting question of whether men’s attitudes to psychological services are influenced by the fact that the majority of psychologists are female (less than a quarter of psychology graduates are men). At the same time of course, the great majority of senior managers making decisions on policy and commissioning are male. Does either of these factors have an impact on the kinds of services that are provided? They also raise the very challenging question of whether there is ‘some fundamental contradiction between how psychological therapy is traditionally practised and traditional masculinity, and whether or how psychological interventions can be adapted to reach out to those who conform strongly to traditional masculine norms’. Following on from this idea, Dr Roger Kingerlee, Dr Duncan Precious, Dr Luke Sullivan and Dr John Barry begin by examining the evidence base in relation to male mental health. Their view is that we are by no means doing as well as we might. The NHS exists to save lives, but if we consider the preponderance of male deaths from suicide we can see that we are letting down those men in greatest need of support. The authors show us that, although the academic evidence base about ‘what works’ with men is not strong, there are some thriving examples of local good practice. They also point to some intriguing evidence that suggests that the outcomes of some psychotherapeutic interventions may differ between men and women. Finally, some startling evidence that our cultural attitudes to gender differences are not necessarily fixed for all time is offered by Dr Ali Haggett’s historical perspective paper. Dr Haggett tells us that in the 18th century the word ‘manly’ would generally be taken to mean ‘virtuous and wise’, not strong and dominant as it tends to mean today – and there was no stigma during that period against men in being ‘sensitive’. By the time of the First World War, ‘shell shock’ was identified as a psychological (rather than a physical) condition and it was commonly believed that it was an indication of ‘weakness’ to suffer from this terrible affliction. Evidence from the years following the Second World War suggests that this belief was still ingrained. Arguably, we are still struggling with these difficulties today despite our much more developed understanding of PTSD. 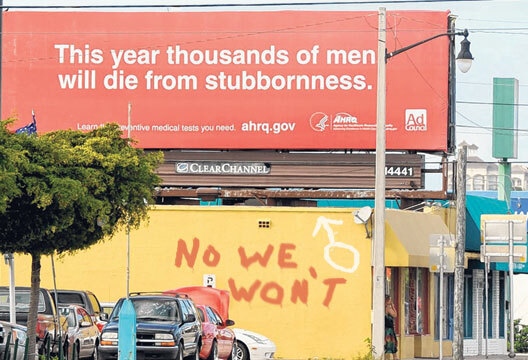 Now – perhaps more than ever – we need to provide and promote psychological interventions and services that, drawing on existing scientific and epidemiological evidence, tackle the stigma associated with male help-seeking, engage men more effectively in treatment and, above all, at critical points in their existence, help them put life before death. Having read all the articles in this collection, it is hoped that you will agree that there is a need for a Male Psychology Section of the British Psychological Society to further our understanding of these issues. If so, you are invited to register your interest (see ‘Resources’, opposite). Addis, M. (2008). Gender and depression in men. Clinical Psychology Science and Practice, 15, 153–168. Cochrane, S. & Rabinowitz, F. (2000). Men and depression. San Diego, CA: Academic Press. Connell, R. (2005). Masculinities (2nd edn). Cambridge: Polity. Crisis (2011). The hidden truth about homelessness, experiences of single homelessness in England. London: Author. Department of Health (2012). Statistics from the National Drug Treatment Monitoring System: Vol. 1. The Numbers. London: Author. Gilmore, D. (1990). Manhood in the making. Yale: Yale University Press. Good, G.E. & Brooks, G.R. (2005). The new handbook of psychotherapy and counselling for men. San Francisco: John Wiley & Sons. Levant, R.F., Smalley, K.B., Aupont, M. et al. (2007). Initial validation of the male role norms inventory-revised (MRNI-R). Journal of Men's Studies, 15, 83–100. Mahalik, J.R., Locke, B.D., Ludlow, L.H. et al. (2003). Development of the Conformity to Masculine Norms Inventory. Psychology of Men & Masculinity, 4, 3–25. Office for National Statistics (1998). Psychiatric morbidity among prisoners. London: Author. Wilkins, D. (2010). Untold problems: A review of the essential issues in the mental health of boys and men. London: Men’s Health Forum.